And for once, it's not food related. I know I'm about 5 years behind on this, but I finally started watching Game of Thrones. And I now understand what all the fuss is about. Problem is, it's consuming my life. I watched 17 episodes my first weekend. I'm now through the first three seasons (so 30 episodes in all) with 30 to go. Of course, you can use fresh tomatoes if you want, but it's a lot more work, and I don't really love the tomatoes this time of year since we have to import them from warmer places. 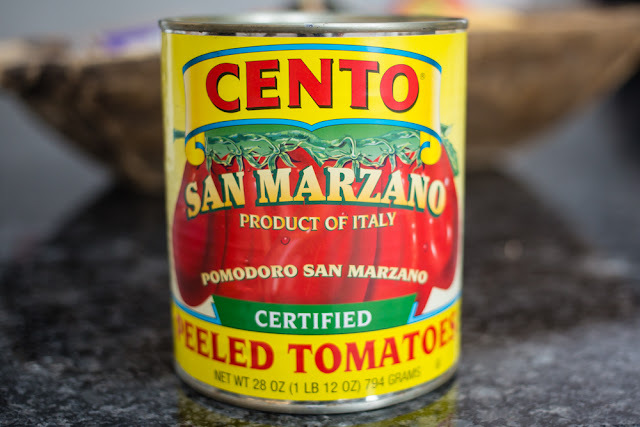 I would much rather use a high quality San Marzano canned tomato (the same kind I use for my homemade marinara sauce.) If you can, look for certified ones that are products of Italy to get the real deal. This lovely can will make the recipe go oh so fast. For the grilled cheese, I used two types of cheese: freshly shredded pepper jack (freshly shredded always melts better), along with a sweet gorgonzola to play with the Buffalo sauce flavors. I mixed a little Frank's wing sauce with some shredded chicken and heated it on the stove until warmed through before constructing my sandwich on some homemade rustic bread made by my next door neighbors. I apologize for the lack of step-by-step photos, but I happened to be making this in the middle of a snowstorm, so the light was crappy and I was in a hurry to get back to GOT. Much like I'll do as soon as I finish this post. 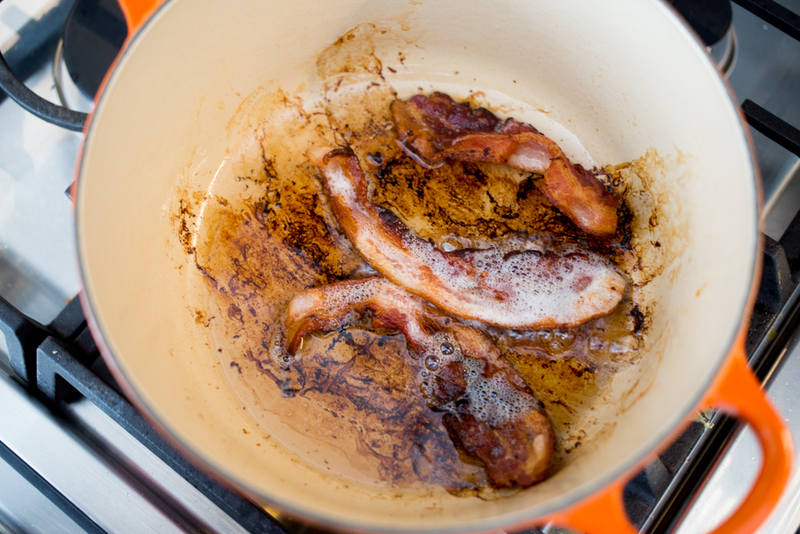 Remove all but 2 tablespoons of bacon fat. Sauté onions and garlic in the 2 tablespoons of bacon fat until soft and translucent, about 8 minutes. Add smoked paprika and red pepper flakes and cook 30-60 seconds until fragrant. Pour in tomatoes (with any sauce from the can), and broth. Add sugar. Bring to a boil. Cover and reduce heat to medium low and simmer for 20-30 minutes. Add whatever fresh herbs you are using and purée using an immersion blender. Cook for another 5 minutes, or until soup has thickened to desired consistency. Season to taste with fresh cracked pepper and sea salt. 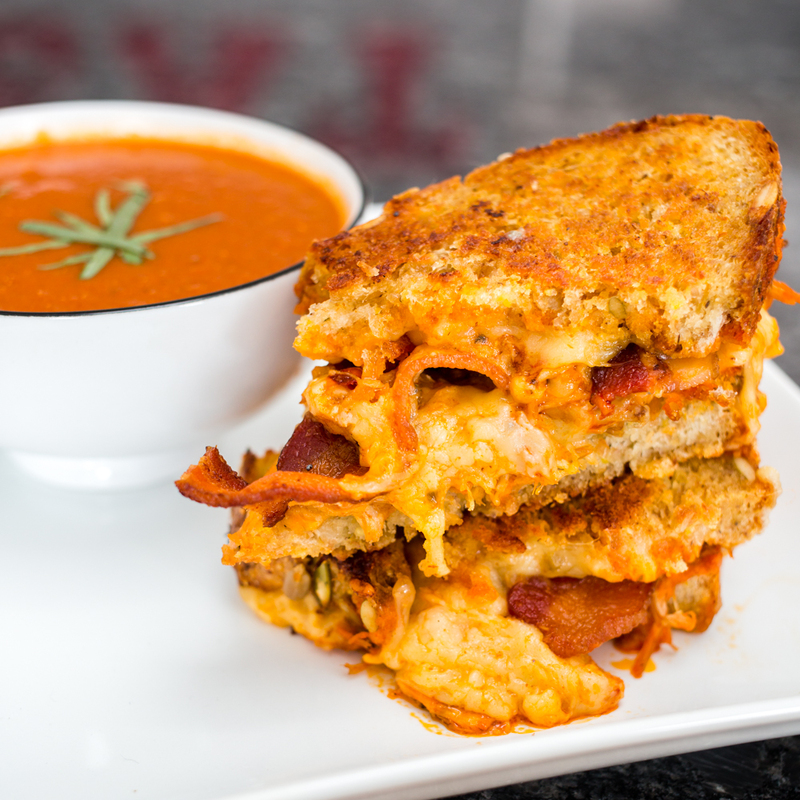 Serve with a swirl of cream (optional) and topped with additional herbs alongside Buffalo Grilled Cheese sandwiches. While bacon is frying, combine shredded chicken and hot sauce in a small saucepan. Heat over medium until warmed through. Butter bread. Put 1/2 cup shredded pepper jack (or more if you desire) on one side of the bread. Top with warm buffalo chicken. Spread gorgonzola on the other side of the bread and top with 2 bacon slices. 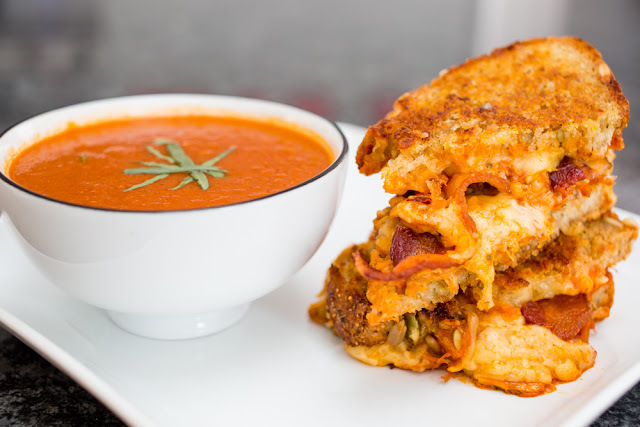 Combine into a sandwich and fry over medium heat until golden brown on both sides and cheese is melted. Serve warm with smoky tomato soup! I cant wait to try this. It looks so delicious. Thank you for sharing. I hope john will like this recipe in weekend.